Product prices and availability are accurate as of 2019-04-17 08:37:07 UTC and are subject to change. Any price and availability information displayed on http://www.amazon.com/ at the time of purchase will apply to the purchase of this product. 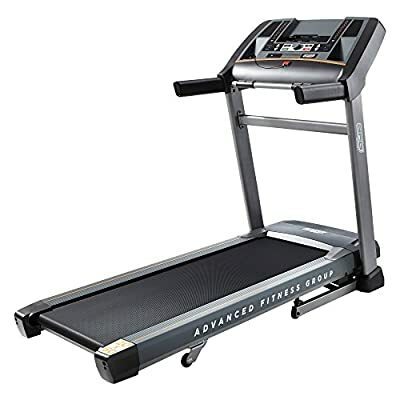 The AFG Sport 5.9AT Electric Folding Treadmill is sophisticated exercise equipment for the tech savvy individual. A 5.9AT quiet motor powers an extended 60 inch deck with variable response cushioning, which adjusts to your specific running style. Tablet integration allows runners to connect to the free AFG app and wirelessly control workouts. Cool breeze fans keep you cool while you exercise. 3 LED screens allow access to 43 unique workout programs, each complete with multiple levels and intensities, while a fully integrated audio system with Bluetooth 4.0 compatibility and surround speakers lets you run seamlessly with your favorite music. Top speeds of 12 mph and inclines of 12% promise challenge for even the most practiced runners. When finished, the EZ-fold assist function gives you maximum storage space at minimum hassle. Signature 3.0 CHP quiet-drive motor works at lower RPM and higher torque for superior sound dampening and temperature control. Extended 60 in. deck with variable response cushioning track adjusts to your specific running style. 43 workout programs and levels incorporated into easy-read 3-LED display. EZ fold hydraulic lift system allows hassle-free folding/unfolding. Speed range from .5-12 mph; 12% incline. Max weight of 350 lbs. . Accessories include tablet integration, cool-breeze fitness fan, and audio system with surround speakers. Assembled dimensions: 76L x 34W x 57H in..